Martin Cross had a relatively short, but interesting career with Carlton in the early nineteen-sixties, during which he played in a couple of the most controversial matches in club history. A lightly-built, elusive rover from North Ballarat, he averaged a goal a game in his 36 appearances for the Blues, and was 20th man in the 1962 Grand Final. After leaving Princes Park, he returned to playing and coaching in the bush, and became an Ovens & Murray League legend. 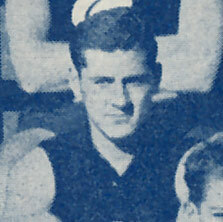 Prior to joining Carlton, Cross played 96 senior games with North Ballarat, beginning in 1956 at the age of 17. Four years later he was invited to Princes Park, where he wore guernsey number 23 when he made his senior debut against St Kilda at the Junction Oval in the first round of the 1961 season. Also on debut that day were future club President Ian Collins, and another star full-forward for the Blues in Tom Carroll. Carlton recovered from a poor first quarter to beat the Saints by 10 points, with Carroll kicking the first five goals of his all-too-short career. Martin featured often throughout his first year, and added to his value by being dangerous around the goals. After hauls of four majors in round 3 against Footscray, and three in round 8 against Richmond, he made the competition as a whole sit up and take notice when he booted eight goals to rout South Melbourne at Princes Park in round 15 – although even that super effort was overshadowed by the infamous clash between rival ruckmen John Nicholls of Carlton, and Ken Boyd of South Melbourne. Boyd king-hit Nicholls off the ball, and later admitted doing so to a newspaper reporter. He was charged by the VFL, found guilty, and never played at the top level again. Cross found the going harder in his second year, when he was asked to play more often as a wingman or half-forward flanker, and his goal-kicking fell away. 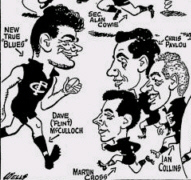 However, Carlton improved markedly from eighth place in 1961 to fourth in ‘62, and set themselves up for a tilt at another flag by edging out Melbourne in the first Semi Final. Martin warmed the bench in all four of Carlton’s finals matches - including our highly controversial victory over Geelong in the Preliminary Final replay, and the following week’s Grand Final clash against Essendon. Fit and well-rested, the Bombers won the 1962 flag by 62 points over the wrung-out Blues. Carlton slipped down the ladder again in 1963, and by round 13 our chances of making the finals again were all but shot. Cross played only his fifth game of the season that afternoon, and no doubt trudged off the Junction Oval in a gloomy mood after St Kilda whipped a lethargic Carlton team by 41 points. Although he saw out the season at Princes Park, that game against the Saints turned out to be Martin’s last for Carlton - but he was far from finished with the game. During the next 21 years, Cross played 160 games for Myrtleford Football Club and coached them to an Ovens & Murray League Premiership in 1970. Between 1972 and 1975 he coached the Dederang Bombers in the Tallangatta and District League, before returning to the O&MFL with North Albury. He coached the Hoppers to a famous victory in the 1984 Grand Final against Wodonga, and lifted them back into another flag decider against Lavington two years later. On that occasion however, Lavington were far too good. All up, Cross coached 378 home and away games, and 14 finals at his three clubs. The longest-serving coach in Ovens & Murray League history, he remains a household name in the Riverina. Contributors to this page: Jarusa , blueycarlton , pblue , Bombasheldon , PatsFitztrick , molsey , tmd1 and admin . Page last modified on Monday 15 of May, 2017 17:10:52 AEST by Jarusa. 1981 Rd 4 - 'Wow' Jones versus 'Bluey' Hampshire.